HMS J5 commissioned in the Royal Navy on 6 May 1916 under the command of Commander CP Talbot RN and was allocated to the 11th Submarine Flotilla based at Blyth, Northumberland. J5 sailed from Devonport on 5 June 1916 having carried out initial trials locally, had two steering breakdowns enroute to Portsmouth, spent two weeks in Portsmouth for more trials and finally arrived in Blyth on 24 June. There were more days of workup and modification before sailing for a patrol off the Dogger Bank on 10 July. During this patrol she had great trouble with depth keeping and on one occasion hit the bottom at 140 feet. On return she was docked at Wallsend-on-Tyne. Leaving dock on 31 July she was in collision with HMS Vixen and had to be redocked at Blyth for repairs to the stem and bow shutters to No. 1 tube. Conditions in the J Class were understandably cramped as can be seen in the above imagery. Before the end of 1916 J5 was in dock on three more occasions. During the last, in October, she had the forward hydroplanes enlarged and a telescopic signal mast was fitted. During the latter half of the year Commander EC Boyle VC, RN assumed command of the submarine. On 13 March 1917 while on the surface in position 56°10´N, 05°55´E, J5 sighted an enemy submarine also on the surface. J5 dived but no attack was made. On 18 May in the same year a small vessel, possibly a submarine, opened fire on J5 from about 600 yards on the port quarter. All the shots fell short though changed in deflection from aft to forward. At the time J5 was silhouetted against a clear horizon which still retained some light from the setting sun whilst the enemy could not be seen. J5 dived, during which operation the hydroplanes jammed with a 10 degree rise. On the following day while on the surface J5 sighted an enemy submarine also on the surface. Before attack could be made the enemy dived and although J5 altered course towards her nothing more was seen of her. In June 1917 it was decided to conduct a large scale operation using both destroyers and submarines to flush out enemy submarines either leaving for patrol or returning to their bases from the Atlantic. Known as Operation BB, it was planned to force enemy submarines to dive through certain areas heavily patrolled by destroyers so that they would be on the surface while passing through adjacent areas patrolled by British submarines. The British submarines employed included J1, J2, J4 and J5. During the ten days, 15 to 24 June, 19 German submarines passed in or out of the North Sea; 12 homeward bound and seven outward bound. There were 26 sightings and 11 attacks made, eight by destroyers and three by submarines. J5 sailed from Blyth on 18 June to take part in the operation. At 03:12 on 25 June while surfaced, J5 sighted the conning tower of an enemy submarine about 6000 yards distant on the port bow. She dived to attack but at 04:00 surfaced and gave chase at full speed. Four torpedoes were fired all of which missed. At 05:00 the enemy opened fire with a gun whereupon J5 dived. On 9 July J5 was submerged with moderate visibility, strong winds and rough seas prevailing above. Through her periscope she sighted an enemy submarine on her port beam. Two torpedoes were fired at about 2000 yards range which Commander Boyle recorded in his log as having missed. 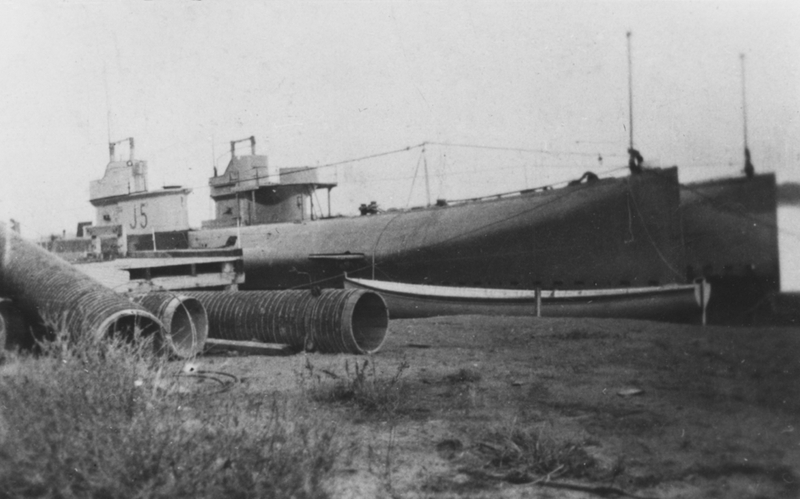 The intended victim, U-86, however, reported torpedo hit the fore part of the ship but did not explode. Between 28 July and 21 August 1917, enemy submarines were sighted on three occasions; 28 July, 4 August and 21 August. On 4 August four torpedoes were fired at the enemy from a range of 1500 yards but all appeared to miss. On 21 August the enemy submarine opened fire and as the shots immediately fell close to J5 she dived and broke off the action. The submarine was in dockyard hands at Newcastle from 9 January to 26 March 1918. While on the surface on 9 April 1918, J5 sighted a large force of ships which appeared to include six battleships or battlecruisers, three light cruisers and ten destroyers. They were recognised as 'friendly' and the appropriate recognition signals were displayed. Nevertheless one destroyer closed rapidly and fired three rounds which fell 50 yards astern before identities were exchanged. On 26 May 1918 when in position 56°01´N, 06°E, and while proceeding on the surface in a south westerly direction at 15 knots, J5 sighted a submarine conning tower to the south. Course was altered towards the other boat, speed was increased and the gun was manned. On closing to 8000 yards the target was identified as the enemy and fire was opened. After firing eight rounds, two of which may have been hits, the gun jammed and the submarine dived. She had been running with ventilators open, however, and these were not shut on diving. Surfacing again with a large bow up angle and only 500 yards from the U-boat she was quite unmanageable. 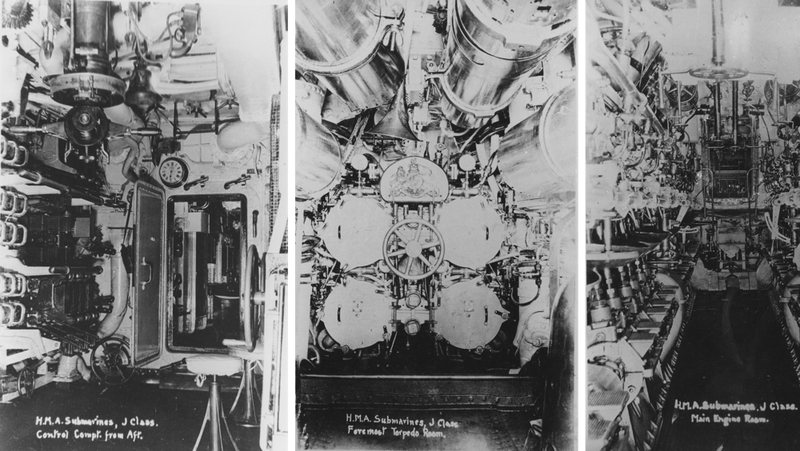 There was an estimated 40 tons of water in the engine room, chlorine was being given off from the batteries and a calcium flare had been triggered off. Luckily the U-boat made off after firing a few more desultory and inaccurate rounds, perhaps also damaged. On return to Blyth the damaged battery cells had to be replaced and J5 was not ready for sea again until 10 June. On 11 June and again on 12 July, J5 was forced to dive due to the presence of a Zeppelin in her area. Gun action stations were ordered on 12 June but before fire the target was identified as the submarine HMS E44. 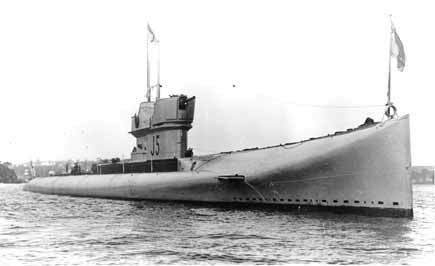 The last submarine to be sighted by J5 during the war was at 07:00 on 30 September 1918 while dived in position 57°28´N, 06°01´E. Four torpedoes were fired but although they appeared to run correctly the enemy was probably out of range. Lieutenant E Starling RN assumed command during October 1918 and J5 returned from her last war patrol to Blyth on 6 November. Following the conclusion of hostilities in World War I, the Admiralty in 1918 presented the six remaining boats of the J Class to the Australian Government - J6 had been sunk in error in 1918 by a British ship. 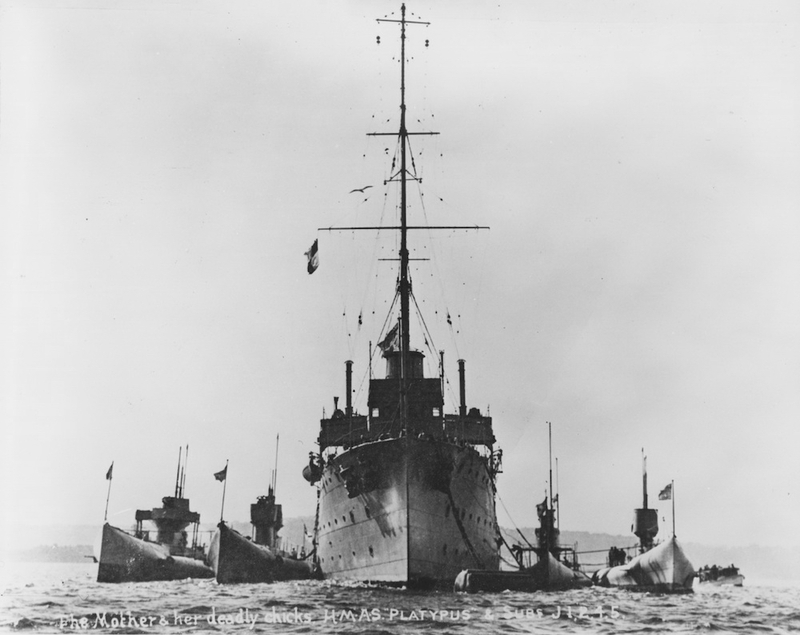 All the submarines commissioned into the Royal Australian Navy at Portsmouth on 25 March 1919, as tenders to the submarine depot ship HMAS Platypus, J7 being the senior boat. The Commanding Officer of J5 was Lieutenant John JA Peirson DSO, RN. 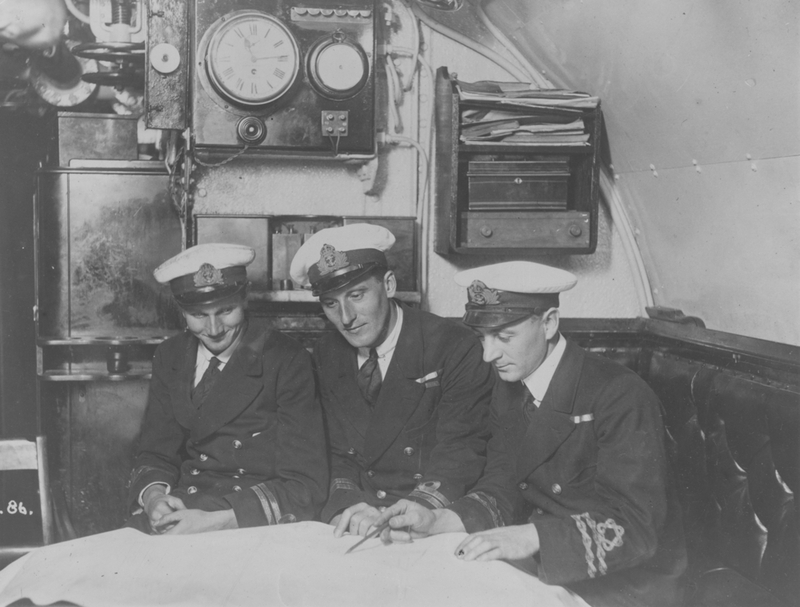 (L-R) Lieutenant CC Alexander, (Commanding Officer) Lieutenant JA Peirson, DSO, and Lieutenant S Sims RANR in J5's Wardroom. On the night of 28 April, the night before the vessels arrived at Port Said, J3's starboard main engine shaft snapped. Thus handicapped she could not keep up with the others and consequently on departure for Aden on 30 April, J3 was in tow of Sydney. The vessels arrived at Aden on 5 May. On the same day the light cruiser HMAS Brisbane, which had left Portsmouth on 17 April, also arrived. On 7 May all the vessels sailed for Colombo. Brisbane took over the tow of J3 while Sydney took J5 in tow as that boat had also developed engine trouble. Three days after arrival at Colombo on 15 May, Brisbane sailed with J5 in tow. From Singapore they sailed for Thursday Island, which Brisbane and J5 reached on 14 June. After calls at Townsville and Brisbane they arrived in Sydney on 27 June. J5 was the first boat of the flotilla to reach Australia. 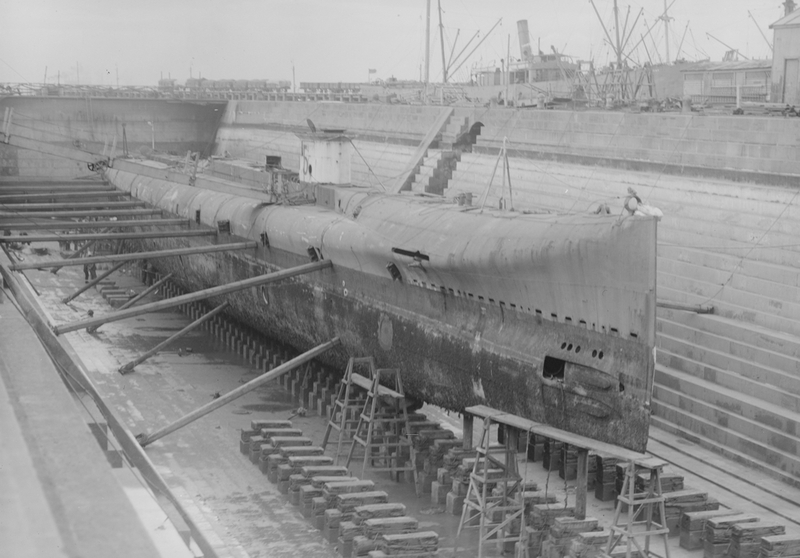 Having arrived in poor condition, the submarines were taken in hand at Garden Island Dockyard for refitting. 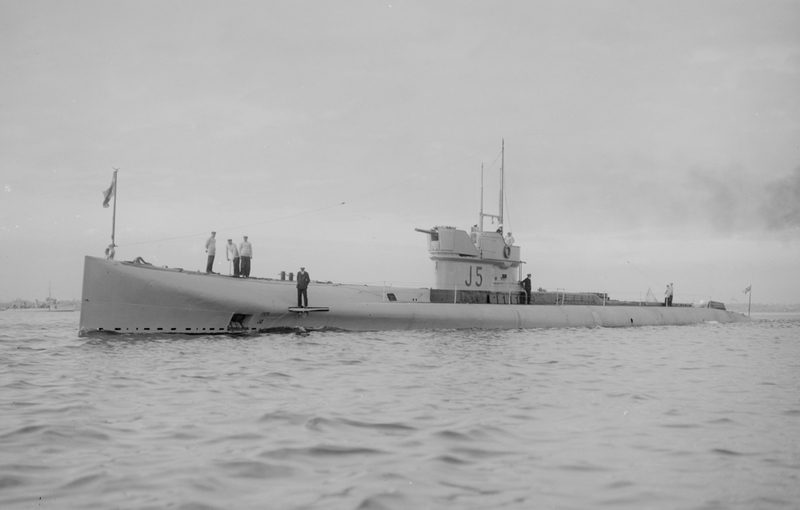 After her refit was completed J5, in company with J2, sailed on 3 May 1920 for the submarine base at Geelong, Victoria. J5 in dry dock following her arrival in Australia. In spite of a major refit the J class boats were never used to their full potential while in Australian service. After uneventful service, little of which was spent at sea, J5 and her five sisters paid off into Reserve at Westernport on 12 July 1922. The boats had become victims of the worsening economic conditions of the time, coupled with their high cost of maintenance. 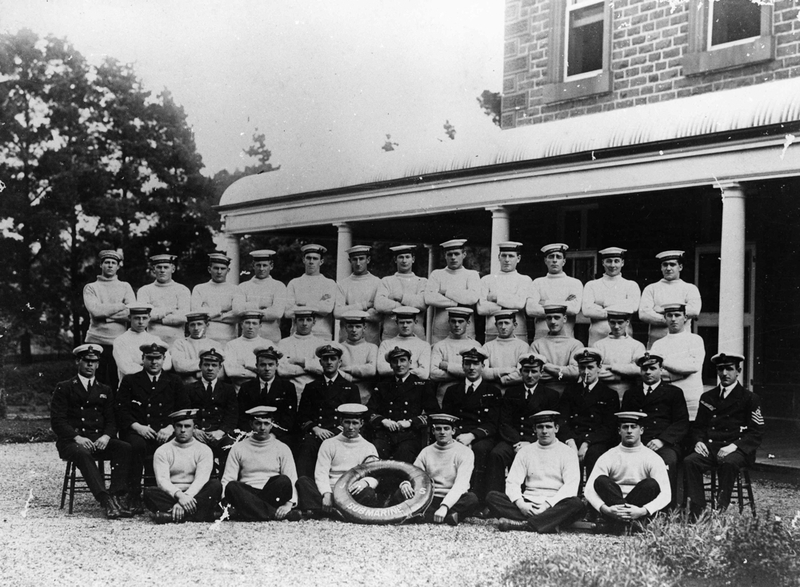 J5 crew outside Osborne House, circa 1920. On 26 February 1924 J5 was sold to the Melbourne Salvage Syndicate. The hull was sunk three miles off Barwon Heads on 4 June 1926. J5 awaiting disposal at Swan Island, Victoria.